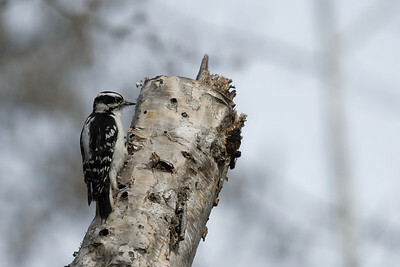 Making good use of the stump of a dead birch tree in Lois Hole Park. St Albert. 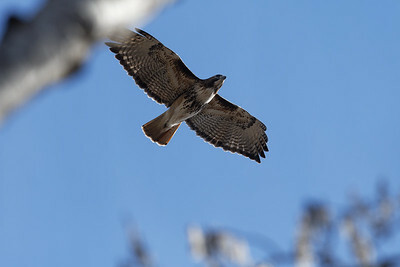 A Red-tailed Hawk buzzes over the tree tops and shrieks it's warning call at me get the hell out of here! Lois Hole Park, St Albert. 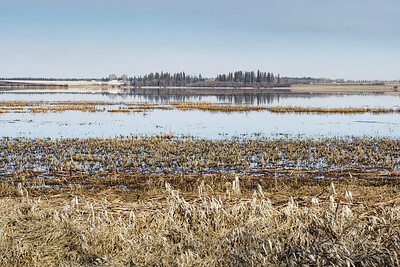 The peak flood having receded I was able to approach the flood plain and record this sunny morning scene over Big Lake. 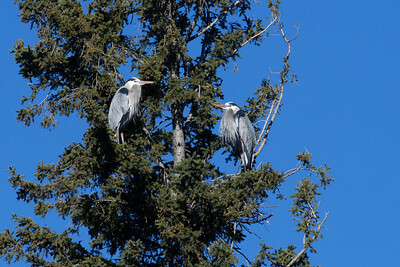 Lois Hole Park, St Albert. 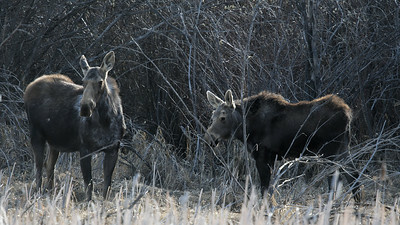 A cow and her yearling calf on the perimeter of the J Poole Wetland, third and fourth moose of the morning. St Albert. 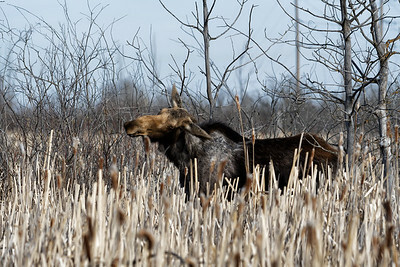 A cow moose munching in the J Poole wetland, the second moose of the morning. St Albert. 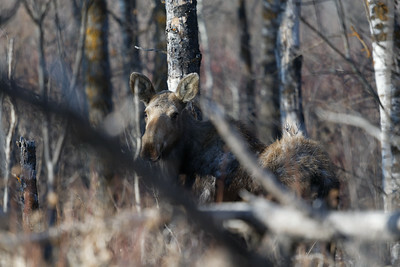 A young bull moose on the trail at the tree line of the J P Poole wetland, the first moose of the morning. St Albert. The flooded Big Lake Interpretive trail, of course in the fall hunting is permitted a short walk beyond this sign, curious for an area designated as a provincial park. 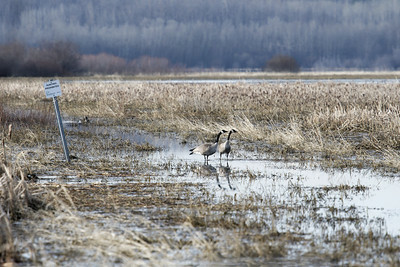 Lois Hole Park, Sturgeon County. 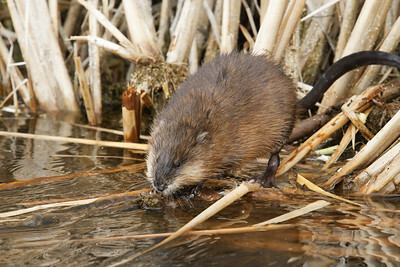 A muskrat pauses to take a bite in the J Poole Wetland, St Albert. 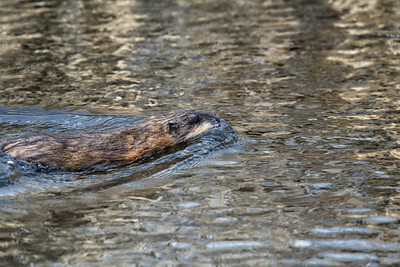 A muskrat swims through the J Poole Wetland, St Albert. 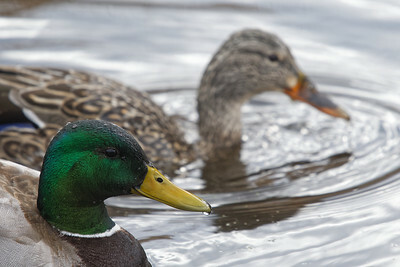 A pair of Mallards court in the J Poole wetland, St Albert. 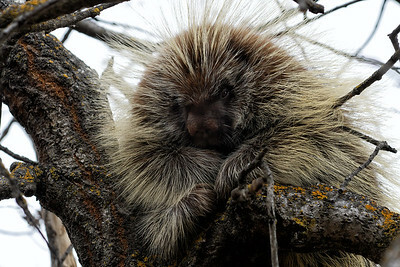 Perhaps not so exotic as the classic "leopard in a tree" but when stomping through the woods of Sturgeon County you take what you can get, so "Porcupine in a tree". 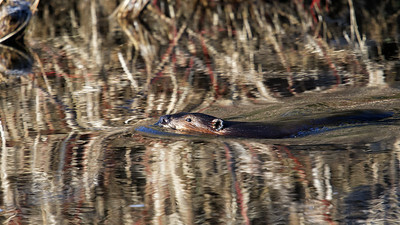 A beaver impressively out swims the current of the swiftly flowing Sturgeon River and creates a bow wave in the reflections caused by the early morning spring sunshine. 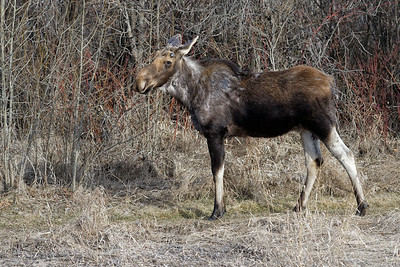 Sturgeon County. 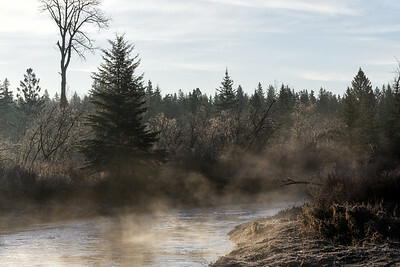 Mist rising from the Sturgeon River early on a spring morning. 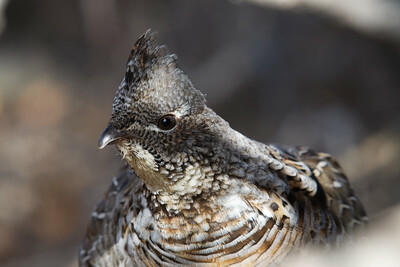 Sturgeon County. 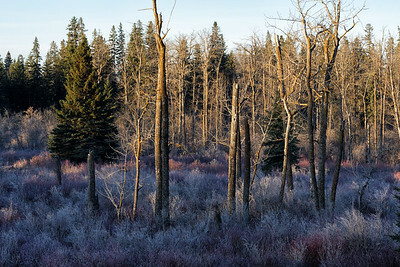 The warmth from the early morning sun has not yet touched the light frost on the shrubbery on the banks of the Sturgeon River. Sturgeon County. 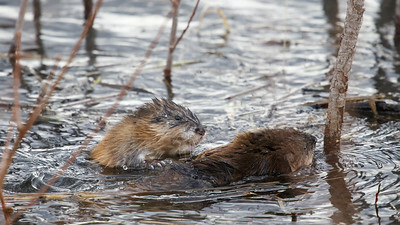 Muskrat kits playing in the shallow flooded wetlands adjacent to Big Lake, Lois Hole Park, St Albert. 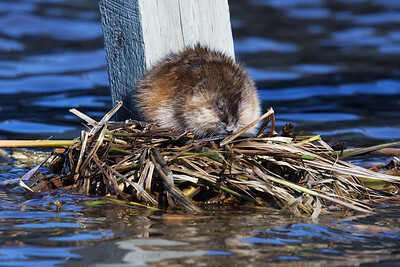 This guardrail post has became a popular spot for Muskrats to hang out and bask in the warming spring sunshine. Sturgeon River, St Albert. 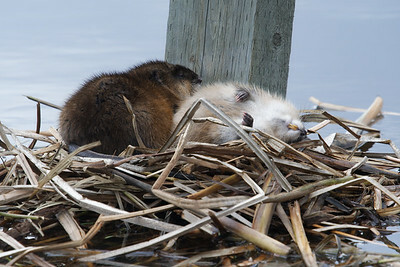 This muskrat has found what appears to be convenient spot to build a sleeping platform and perhaps the start of a lodge? It will be in for a bit of a surprise when the river level falls, this is a guard rail post on the bike path that runs underneath Ray Gibbon Drive in St Albert. 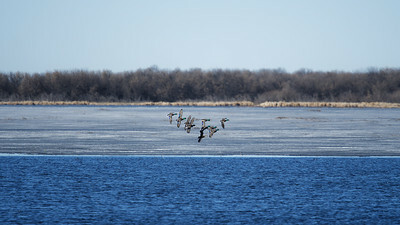 A flight of Mallards sweep across Big Lake in early spring. Lois Hole Park, St. Albert. 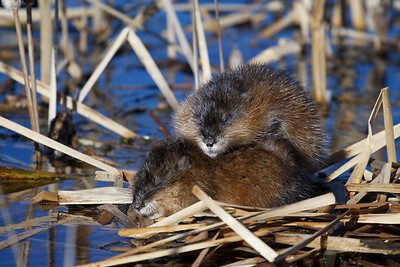 Muskrats sharing an intimate moment. Sturgeon River, St Albert. 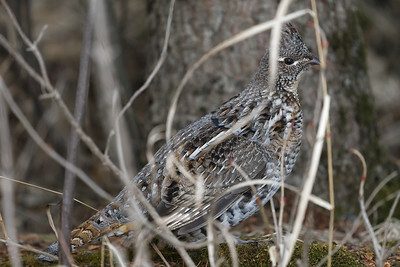 Head and shoulders of a Ruffed Grouse peeking at me through the bush. 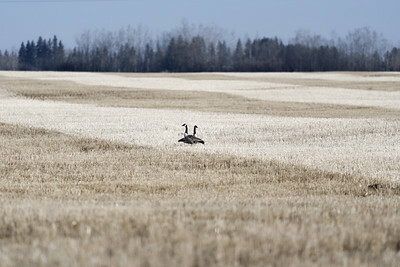 Sturgeon County.